The staff and Directors of Jamberoo Golf Club wish all members a happy and rewarding New Year. The 29th of December marks the last comp played on our course this year. It was a ‘countdown’ to mark the upcoming end of the year. I hope you enjoyed this interesting team format. 2019 promises a whole lot of new and exciting competitions including the Eclectic Competition, the Just Bathrooms 4BBB Cup and the mid-week hole-in-one Jackpot. Be alert for further new competitions including an ‘Ambrose’ championship to be sponsored by Oaks Automotive. More details will follow in the new year. 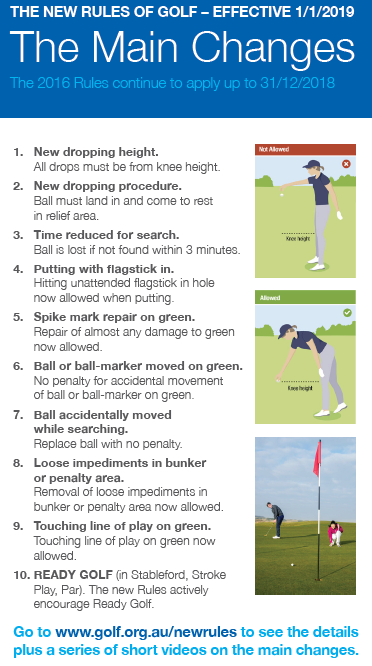 The first of January also marks the introduction of the changed rules of golf. I hope all members are aware of the new rules and procedures. If not then click here. The Club will also be varying the way we decide on prizes for stableford and par events. For a 3 month trial we will run these events as single grade days. The reason for this is that we will be able to award more and better prizes for the overall best scores achieved on the day and also have a larger ball comp. A best gross score will also be contested for larger fields. ‘Nearest the Pin’ and ‘Drive and Pitch’ prizes will still be awarded in grades and stroke rounds and monthly medals will still be played in grades as well. The ‘Super Shot’ will continue to run as it is one of the most popular events run during our comp rounds. and Drumond Golf at Shellharbour will again sponsor the monthly Drummond Stableford the first Wednesday of each month. The Just Bathrooms Mystery Nine will be contended every third Wednesday of most non-school holiday months. The Ladies, Lady Veteran Golfers and Mens Veterans also have many interesting events planned for 2019 so why not get involved and play and enjoy the many varied competitions to be run on our course. I hope to see you on the course, don’t forget to wave and say hello. May all your drives go straight! The teams are taking shape and many different scenarios are being discussed over the selection table. One particular issue is that we need one more ‘A’ grade golfer to play in the ‘B’ Pennant team (handicaps 5 -12). If you have a handicap of 12 or less and are available on Sundays in February and March then please leave your contact details with the office or starters. Come and join the Pennant team. Not many comps this week with Christmas Day and the like. On Boxing Day, golfers faced the annual prospect of slow Christmas greens, with Harry Osman being a clear winner with a great 41 points. Greg Seymour, playing in the second last group was able to grab second place with 37 points and Dave Ransom just pipped John Anthony and Peter Hughes on a countback for third, luckily sinking a curling second putt on the last green that proved to be the crucial difference. Saturday saw the annual end-of-year countdown competition. Scoring was impressive and in the 4 person section the team of Mal Garratt, Al Thrower, Wayne Arnott and Peter Francis score an remarkable 101 points to win by 5. In the 3 person event the team of Jason Aboozaid, Con Kiayias and Kevin O’Rourke won by 9 points with a score of 88 points. The Ladies section was won by Lyn Beringer, Jenelle Anderson, Pam Middlebrook and Shirley Dixon with a good 85 points. Con had a great end of year round winning the super shot as well.